The name Ed Hardy probably does not mean much to us, unless you have stepped into high end boutique shops. Don Ed Hardy used to be a tattooist (or still is), but in these days, he has whored out his name and artistic integrity to hawk women hand bags and other fashion garbs. The phrase 死先侮辱 printed on this Ed Hardy handbag was intended to represent "die before dishonor", however it is gibberish in Japanese. This phrase is not even close in Chinese. It is read as "die first, insult (later)". The printed phrase sounded more familiar to the practice of 鞭尸, a punishment where buried body is unearthed and whipped in front of his/her surviving family members, than "die before dishonor". Plus, Chinese already have an idiom, 寧死不屈. subject: Tattoos, do they really mean this? Hi, a guy I went to high school posted this picture of his new tattoo on Facebook and I was wondering if they really mean what he claims them to say. 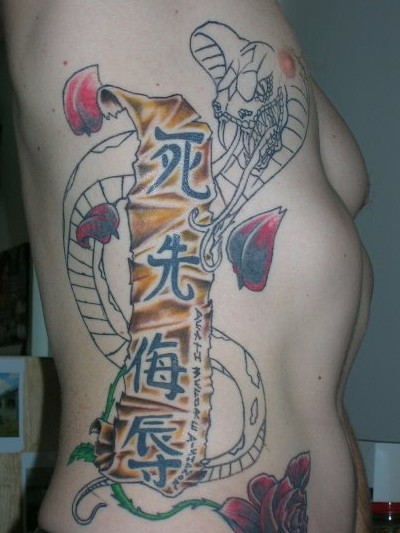 The tattoo he says it reads, "Death before dishonor." 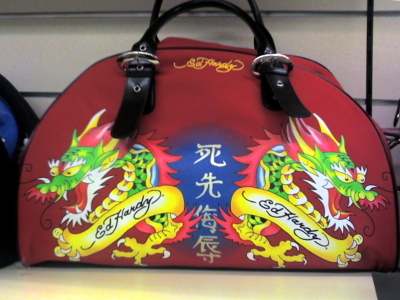 Someone actually copied the phrase from Ed Hardy's pseudo-Japanese handbag and tattooed on himself.